Prepare your own smooth, low fat, frothy cappuccino (1). Made using completely natural high-quality coffee beans. Created using fresh milk. Delicious coffee shop-style froth in every cup. Enjoy expertly crafted drinks with 8 cappuccino sachets. 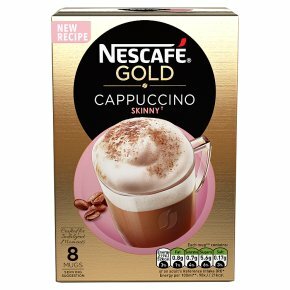 (1) 55% less fat than NESCAFÉ GOLD Cappuccino Unsweetened Taste.The coffee beans in our NESCAFÉ Cafe Menu Cappuccino Skinny are prepared by experts for a great-tasting cup every single time. Enjoy the milky taste and flavourful coffee with every sip, no matter when you fancy a break.